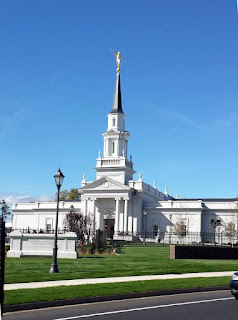 Earlier this week, our family took the opportunity to tour the Hartford, Connecticut temple of the Church of Jesus Christ of Latter-day Saints. 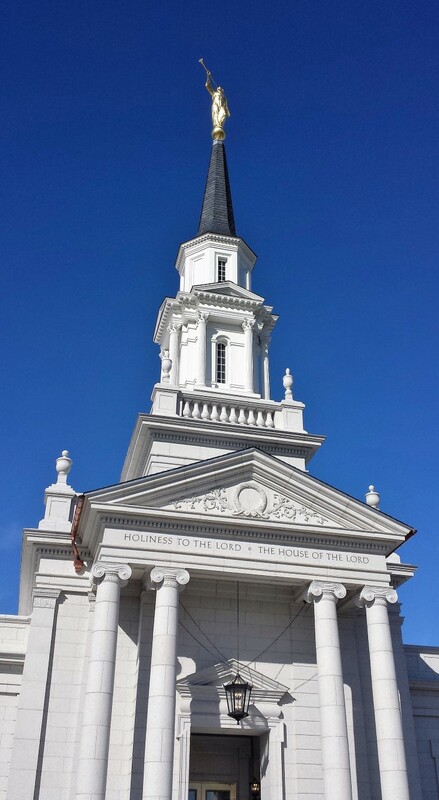 For us, the temple is an extremely special part of our theology. 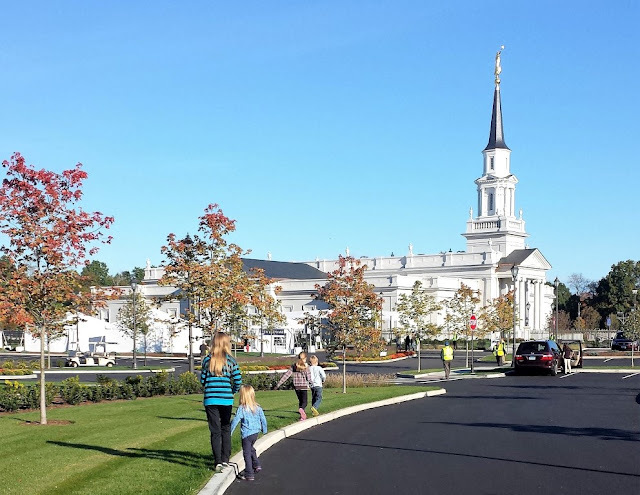 Usually only certain adults can go inside temples, but when a new one is built there's initially a 3-4 week open house where anyone can come in and take a tour. Here's what we learned about how NOT to take a successful spiritual pilgrimage with your children, in 10 simple steps. We decided to go on Wednesday, when the kids had a day off school for Yom Kippur. Of course, we waited to reserve a tour time until the only tours left were, as my 12-year-old self would've said, "at the buttcrack of dawn." This should have been a sign to us to abort the whole plan and turn back. It wasn't. A friend who was going with us got sick in the night and cancelled, and then Phillip found out about something happening at work that he really should be there for, and since he was no longer needed as an extra driver we decided he'd go into work while I took the 6 kids to the open house. By myself. When Phillip expressed his concern about me doing all the driving and kid-wrangling alone, I waved him away with an arrogant, "Please. I do this all the time. It'll be fine." Thus setting the stage for the perfect storm. We were on the road by 7:01 AM. I was going to take a picture of the clock but I didn't want to set a bad example for my tween who I've told never ever EVER to use your phone while you're driving. But apparently I didn't do everything right, because I heard "I'm bored" a bazillion times, except from the child who amused themself by quietly drawing all over the car speakers with a dry erase marker. One child claimed they were about to sustain serious kidney damage if we didn't pull over right that second, so we stopped at a rest stop with the world's grossest port-a-potties. I mean, all port-a-potties are the world's grossest, but these were even grosser. They were full practically up to the top, and you know how when one kid goes to the bathroom the rest suddenly realize they have to go, too? We finally arrived and joined our tour group, but the fun was just beginning. Before going in to the temple, the open house people ask everyone to help protect the carpets inside by putting these little shower cap-looking things over their shoes. If this doesn't sound like it's a rough equivalent to Chinese water torture, you're obviously not my 2-year-old. 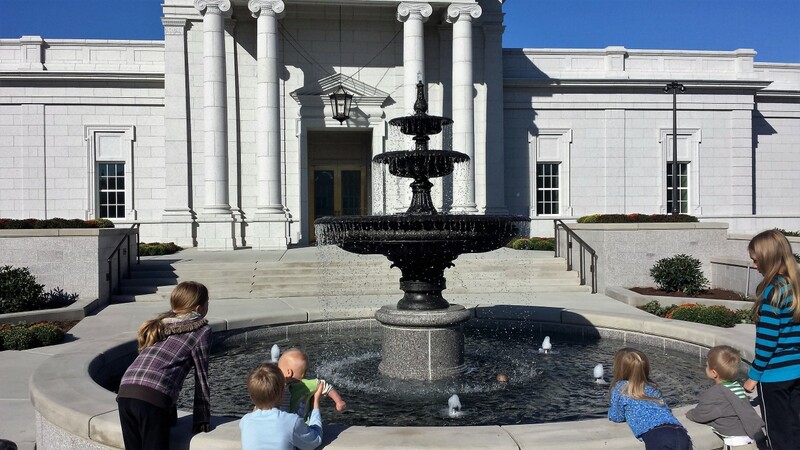 Once we had our shoe booties on and were literally walking into the temple with our tour group, I picked the baby up out of the stroller to carry him inside — and Houston, we had a problem. He hadn't pooped for a few days, and had chosen this as a great time and place to let it all out. 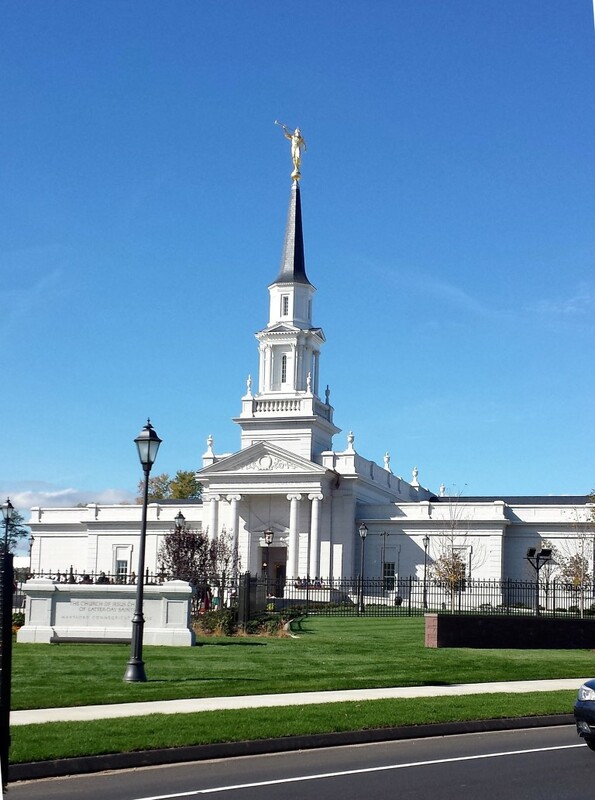 Note to self: babies just love a good explosive diaper blowout at the holiest edifice on earth. We were already a public spectacle, with so many kids crowded around and the toddler alternately whining and raging about his shoe covers. Now we were also blocking traffic with a poopy baby. We high-tailed it over to the side to change his diaper in the stroller, which was neither easy nor neat. A sweet volunteer came over to dispose of the soiled diaper which was covered with poop both inside and out. I repeat: this nice man was touching poop that wasn't even his own kid's, and everyone knows that's the grossest kind of poop. At this point, a smarter woman may have just retreated to the car and driven home never to leave the house again, but we soldiered on. Throughout the temple tour the baby was fussy and required a whole lot of bouncing and shushing, which would've been fine if the 2-year-old wasn't growling and refusing to walk. In the end, the tour guide ended up carrying the baby while I carried the toddler, calmly showing us the rooms, asking my older kids questions, and never once letting on that we were just one bearded lady short of a circus side show. Before we left home so very early that morning, we'd all said a prayer that visiting the inside of the temple that is so sacred to us would be a spiritual experience. 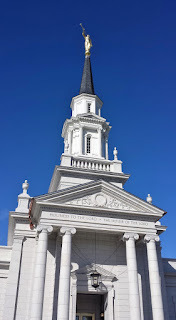 By "spiritual experience," I had NOT meant rushing through the temple squeezed between scheduled tours, feeling self-conscious and anxious about how much inconvenience we were causing everyone. But surprisingly, I did have a spiritual experience that day after all. The reactions of everyone around me was a sweet reminder that God loves families. No one made me feel like a spectacle or a bother (even though we were totally both,) not even the poop-touching volunteer. The open house chairman who offered us a special tour kept calling us a "sweet family," even as my toddler was giving him the stink-eye the entire time. It meant a lot to me to see Christ-loving people embrace not just the abstract idea of "the family," but my family and all the mess, noise, and chaos that goes along with it. I guess to paraphrase a verse from Galatians, sometimes the fruit of the spirit is love, gentleness, meekness, goodness, and acting like it's totally no big deal to handle someone else's kid's poop. I didn't even want to touch it, and it was my own kid's! I find that even disasters make great stories later on, so I suppose there's always a silver lining. Ha ha, oh no, and a happy ending of sorts. Perfect! I seriously love what you said about embracing not just "the family," but a SPECIFIC family. I could for sure work on this. Not just with families but individual people too--I need to not just love "my neighbor" in a general sense, but the actual specific people I have to deal with, who may be annoying/imperfect/etc. Great reminder. What a great account of a day that will be remembered fondly by all the family (and retold to your little ones by the big ones). Thanks for sharing. That's a lot harder. My favorite youth talk ever on church was on that exact topic. Oh my! What a crazy day. I remember those "poop everywhere" days. Ick. My kids loved to have poop explosions at the worst moments.